Resource center A Look at Drug Abuse. Common Signs and Symptoms What Are the Dangers of Drugs That Cause Cross-Tolerance? Cross-tolerance occurs when a person develops a physical tolerance to a specific substance, which then translates to tolerance of other drugs. While tolerance may sound like a benefit, when referring to drugs, it means that more of the substance is required to create specific effects. For example, if a person has developed a tolerance to heroin, they are less likely to respond to opioid pain management if it is needed. Currently, medical researchers believe that cross-tolerance develops because of changes in liver enzymes caused by the primary substance. However, there could be other functions, like neurotransmitter release and absorption, which may also play a role. The most common form of cross-tolerance involves drugs with similar effects because they act on similar parts of the brain. For example, a person who abuses Percocet will develop a cross-tolerance to OxyContin. Sedatives: Drugs like benzodiazepines, alcohol, barbiturates, and sleep aids all act on similar receptors in the brain. A person who is a heavy drinker, for example, will have a cross-tolerance with anti-anxiety medications like Xanax or Klonopin and medications to treat insomnia, such as Ambien. Opioids: All Mayo Clinic lead to cross-tolerance within the class. If a person receives a prescription for oxycodone, for example, and develops an addiction to it, they may switch to a stronger drug like heroin in order to feel the original euphoria. However, they must also start at a higher dose of heroin to experience that euphoria compared to a person who has no existing tolerance for opioid drugs. Stimulants: Many stimulants can lead to cross-tolerance. People who abuse amphetamines like MDMA, for example, will have a tolerance to cocaine or Ritalin without ever taking these drugs. Psychedelics: Mescaline (peyote), psilocybin (shrooms), and LSD all act in similar ways on the brain, so they lead to cross-tolerance. People who develop a tolerance to hallucinogens are also likely to develop a cross-tolerance to marijuana, PCP, DMT, and ketamine, which all act through modulating serotonin via specific pathways. Stimulants and nicotine: It is rare to find drugs that can create both a stimulant and depressant or analgesic effect, but nicotine is one of those substances. In the US, it is most commonly ingested through tobacco, although synthetic nicotine for vaporizers or e-cigarettes is becoming more common. Since nicotine creates stimulation and a sense of relaxation, it can lead to cross-tolerance with several other substances, such as stimulants, particularly prescription stimulants like Ritalin and Adderall, which impact the dopamine receptors. Nicotine and caffeine both develop cross-tolerance with prescription stimulants. Nicotine and alcohol: People who drink heavily are also likely to be introduced to smoking cigarettes, and many people who have one addiction develop the other. Both of these drugs are legal for American adults, and they involve some socializing and relaxing experiences. 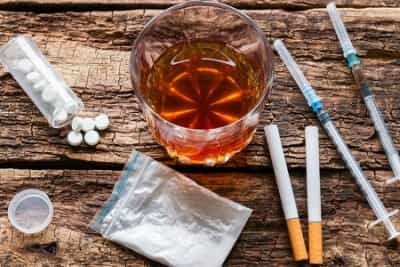 The cultural aspects of alcohol and nicotine seem to encourage cross addiction, but scientists have also found that one drug leads to cross-tolerance with the other. This could be related to nicotine’s sedative effects since alcohol is a depressant. Cannabis and sedatives: Cannabinoids act as depressants on the brain, leading to a sense of relaxation. This may lead to some cross-tolerance with alcohol, barbiturates, and other sedatives. Although cross-tolerance and cross-dependence can be important tools in the detox process – for example, using benzodiazepines to ease a person off heavy alcohol use – they can also be very dangerous. A person who abuses drugs may have a harder time finding an effective prescription medication for an issue like chronic pain, for example. Cross-tolerance can lead to relapse. While medically managed withdrawal is an important option for safe detox, especially for people who have abused alcohol or opioids for a long time, medications used to manage detox are often similar to the original drugs of abuse. This is a benefit because it eases withdrawal symptoms, but it is also a detriment because it can lead to greater cravings for drugs, especially if the person is not monitored appropriately by medical staff. People abuse methadone and buprenorphine, for example, although these drugs were developed to help people struggling with opioid addiction to wean off narcotics. Cross-tolerance is also dangerous because addiction to one substance means the person is more likely to struggle with addiction to other drugs. While this is part of the disease of addiction in general – any intoxicating substance could spark a relapse, especially in the early days of recovery – certain substances are more likely to trigger addiction than others. A person who suffers from alcohol use disorder and then goes through recovery may become addicted to benzodiazepines later if they receive a prescription for the drugs from a mental health professional. This is also more likely to lead to polydrug abuse, which can cause serious physical harm. For this reason, it is important for people who have ended an addiction to let their doctors know about their history of substance abuse, so the doctor does not unknowingly trigger relapse with prescription medicines. In a rehabilitation setting, with appropriate medical supervision, a person may find that cross-tolerance to some substances is used during detox to ease withdrawal symptoms. However, this should only be attempted with professional medical supervision and support from therapists or counselors.